On Sunday, 24th June, Emma will sing a mini-prom during The Royal British Legion (Holland Branch) Picnic in the Park in Wageningen, the Netherlands. 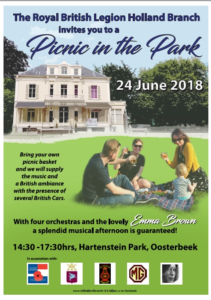 Weather-permitting, it promises to be a lovely afternoon to enjoy Hartenstein Park and listen to the three orchestras which will be playing there. The event is free, with a collection for The Royal British Legion. Don’t forget your picnic and chairs! Sunday, 24thJune, 14:30, Hartenstein Park, Wageningen, the Netherlands.